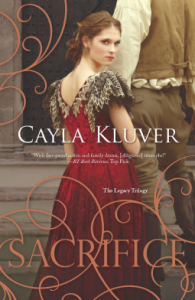 The third book in Cluver’s fantasy series, Sacrifice, is the story of Alera, the queen, trying to find a way to rule her people while pleasing their new overlords, AND while keeping her own heart’s content with her love. We get the final story in Hytanica’s tale in a few different perspectives, mostly from Alera, and also from Shaselle, a young woman who is desperate to be her own woman but also being accepted. Life in Hytanica is downright contentious – their new rulers are intolerant of Hytanican pranks and revolts intent on restoring their independence. Alera must find a way to bridge the gap while still remaining true to both herself and her people. The man she loves belongs to the enemy, but she has learned it matters not to her. Shaselle is expected to marry a man and settle down, but Shaselle has other things in mind. She wants to ride horses, she wants to be her own woman. But again, she also wants to please her family, who is still mourning the murder of their father by their rulers. Both Shaselle and Alera are similar in that they still aren’t quite sure of their new roles and their part to play. They’re still experiencing growing pains and having moments of selfish immaturity. But when it comes time to buck up and make some real decisions, both women follow through with flying colors. I enjoyed Sacrifice. It’s dense and the pacing felt very similar to the first two in that it felt slow yet kept me engaged. The political backdrop is fascinating and complicated, though not enough so that I wasn’t engaged. I was satisfied with the fairly epic ending, wondering how in the world Alera would be able to have her happily-ever-after. She manages it. Barely. I still see fragments of a child in Alera, but by the end of the series I can also see how much potential she has as well. Interesting series – I’m glad I read it.